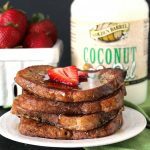 This Coconut Oil French Toast is easy, delicious, and the perfect breakfast! 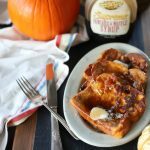 French toast is such a classic food, a food many people make on the weekends and I’m not sure I’ve met anyone that doesn’t like it. 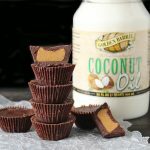 When we went dairy free and I switched out the butter for coconut oil for the first time, I was a little nervous my husband wasn’t going to like it. That he would notice that distinct butter flavor was missing. But the opposite happened- he LOVED it! 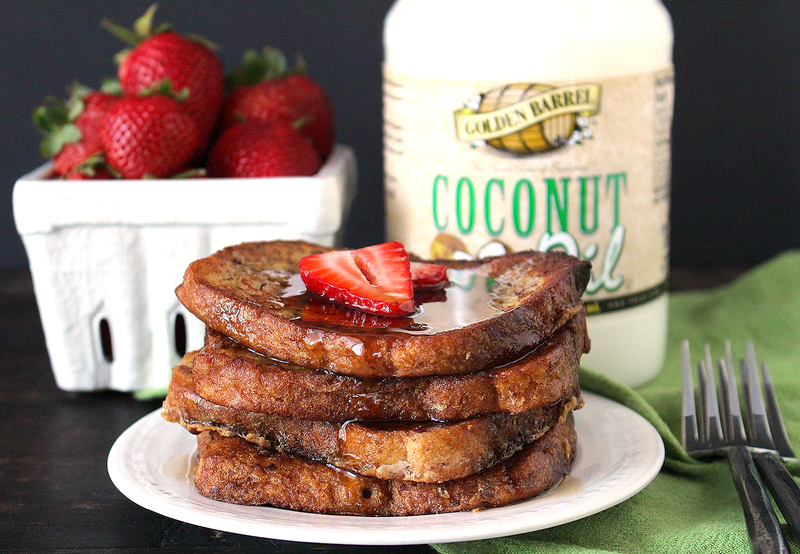 The Golden Barrel Coconut Oil adds a richness that makes the french toast irresistible! I have served this to many people that aren’t dairy free and they love it as well. 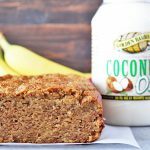 It’s a great, easy way to incorporate healthy coconut oil into your diet. Just that one switch makes all the difference flavor-wise. I know you’ll love it and won’t miss the butter. 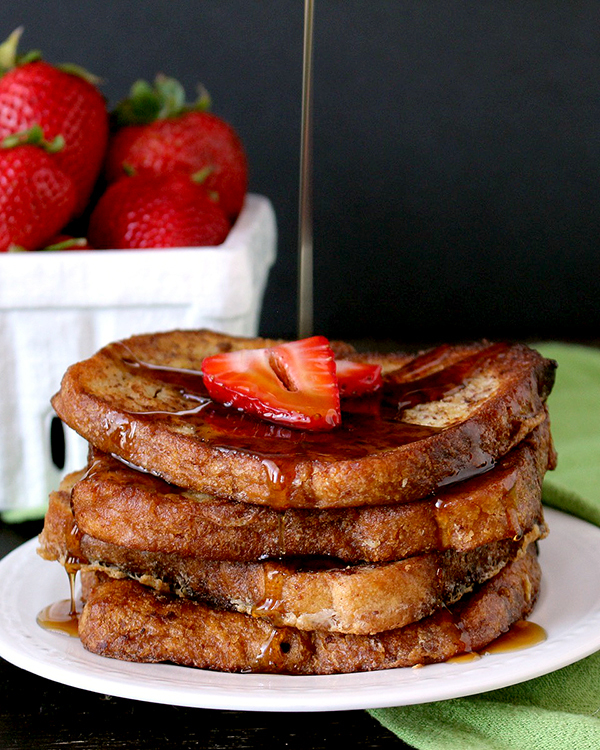 I have to admit- although this french toast is delicious straight from the pan topped with maple syrup, I almost always make it to be used for peanut butter and jelly sandwiches. 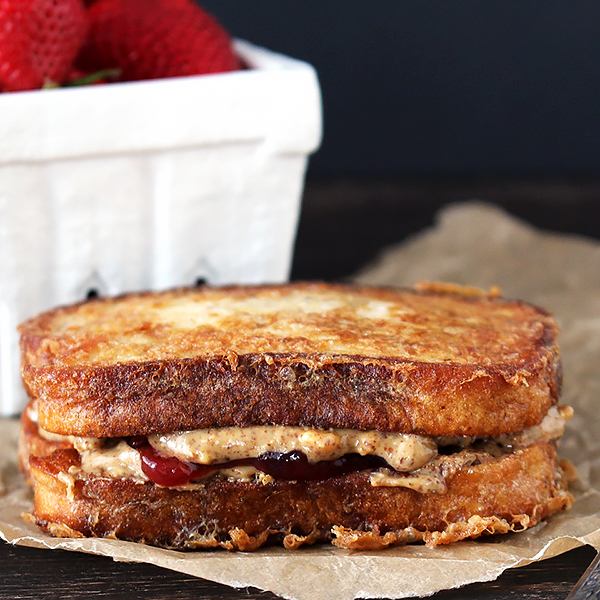 Well, almond butter and jelly for us, but peanut butter works too. After I make a whole loaf of bread, I let it cool slightly then make the sandwiches. They are so good straight from the fridge- one of my husbands favorite meals in fact. A little tip we have been doing for years is to spread both sides of the bread with almond (or peanut) butter, then add the jelly to one side. That helps the jelly not soak into the bread and make it soggy. It’s also a double dose of nut butter which is always a good thing. 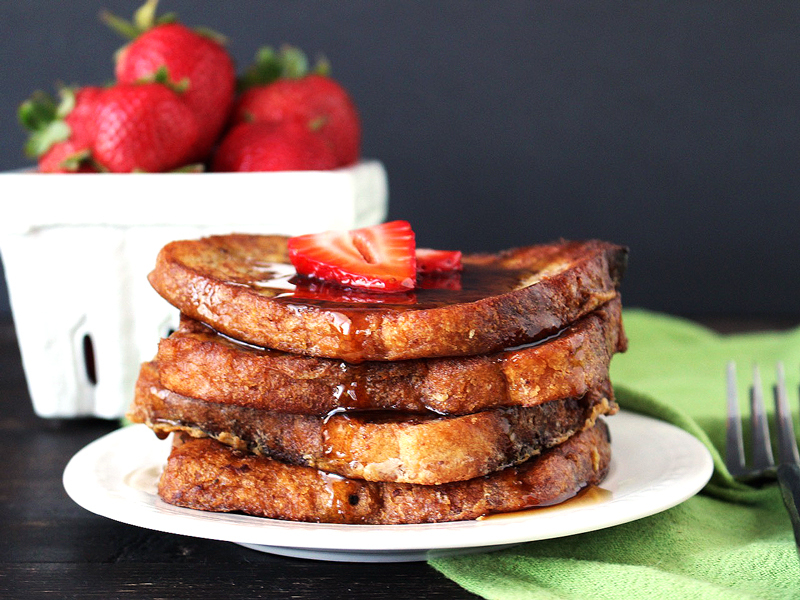 The french toast itself isn’t very sweet. The cinnamon adds a nice flavor, but not much sweetness. I knew this would be eaten either with maple syrup or jelly and that the bread itself didn’t need much sugar. It is perfect and not overly sweet. The measurement for coconut oil is as accurate as I can get, but it may be slightly different depending on the pan you have. I have a pan that only does one piece at a time and use about 1/2 tablespoon each time. If you have a larger pan then use a little more and definitely don’t be shy! I use gluten free bread for this, but feel free to use whatever is your favorite. I also used cashew milk so it’s completely dairy free. You could also use almond milk or any other milk that you would like. 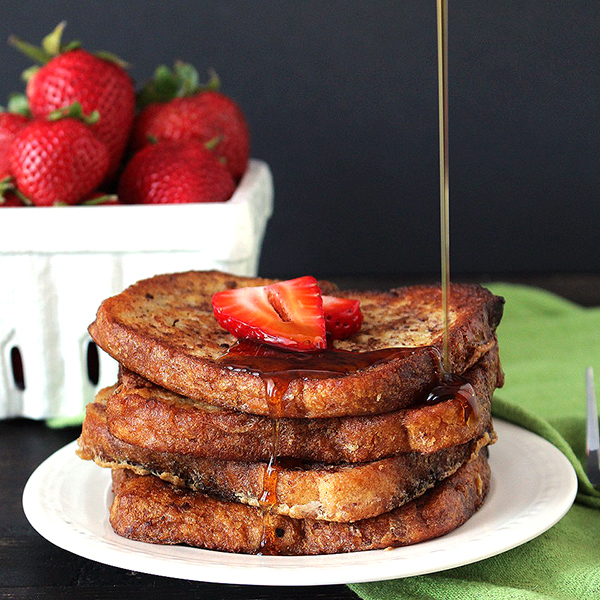 You will love this take on french toast. An easy switch that makes it incredible! In a medium, flat-bottomed bowl, mix eggs, milk, and cinnamon together until completely combined. 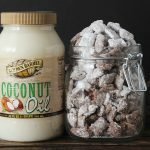 Over medium heat, place approximately 1 tablespoon of coconut oil in a skillet and let melt. Dip bread in egg mixture, flipping and coating both sides. Place bread in the pan and cook 3 minutes or until lightly browned, flip and cook another 2 minutes. Remove to a plate and cover with a clean towel to keep warm. Repeat until all bread is used, adding more coconut oil between each batch. If the oil starts to burn, turn the heat down and wipe out the pan with a paper towel. Be careful not to burn yourself! *To make the ultimate peanut butter and jelly sandwiches: wait until bread has slightly cooled then spread nut butter on both sides of the french toast. 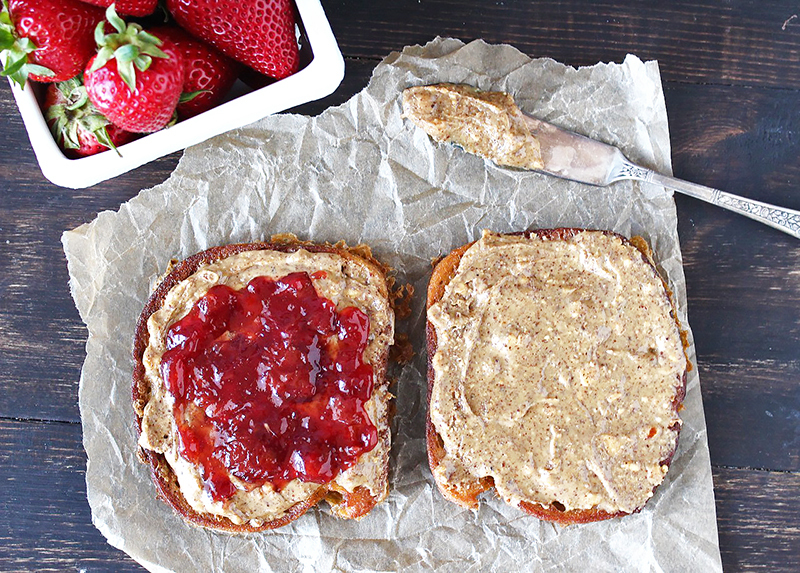 Spread jelly on one side, over the nut butter and close to make the sandwich. Refrigerate until ready to eat.